Valencian citizens will be allowed to purchase up to THREE plots of land. These citizens are then limited to the purchase of ONE plot of Nanthalion land and the citizen has to purchase all of the Valencian land before buying in Nan, to qualify for residents discount. Once they buy in Nan, any future Valencian puchases are at the full price. If you are, originally, a Nanthalion citizen but choose to relocate to Valencia (and you do NOT own any Nanthalion property) then you will qualify for the THREE plot purchase at the resident discounted price (see Discounts) . In the event that a re-locating Nanthalion citizen does own property they have a couple of options to choose from: 1) They can keep their Nanthalion property which restricts them to the ONE Valencian plot limit. -OR- 2) They can sell ALL of their Nanthalion property in order to qualify for the THREE plot allowance in Valencia. Valencian residents are entitled to a 30% discount on land purchases -in- Valencian. Should they choose to also purchase land in Nanthalion (see Limit above) then they will be charged a 30% tax on the value of the land. Should they decided to re-locate to Nanthalion, and wish to purchase more than ONE plot of land there, then they can sell ALL of their Valencian land in order to do so. **NOTE** Nanthalion property has neither a TAX nor a DISCOUNT on its land prices. Nanthalion citizens who already own a piece, or two, or three, of the Empire are limited to ONE plot of Valencian land. In the event that a Nanthalion citizen does NOT own Nanthalion property, they may purchase up to THREE plots of Valencian land.. however, they are then limited to ONE plot of land in Nanthalion and the citizen has to purchase all of the Valencian land before buying in Nan, to qualify for residents discount. Once they buy in Nan, any future Valencian puchases are at the full price. Non-residents will be charged a 30% tax on the value of the land. Even if the non-resident qualifies for a THREE plot purchase, as long as they consider themselves a resident of Nanthalion and not a resident of Valencia, then they are subject to the tax. TEN Valencian properties have been set aside as "Homesteads." 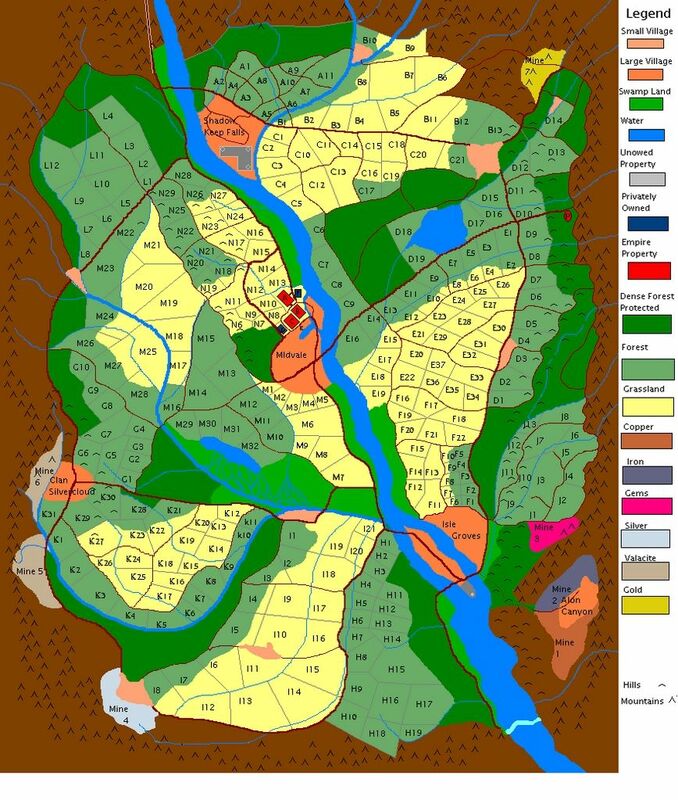 These are plots of land that have been randomly chosen and their locations will NOT be revealed until the a citizen of the Empire attempts to purchase it. In other words, until the coins are being handed over for land purchase, the qualifying homsteader will not know that the land they have chosen is a homestead (this prevents people asking about a piece of land and discovering that it's "free" before any sincere attempt is made to purchase it). Players can choose to live in one of the many villages in Valencia. However, they will be limited to an Adobe Hut (no basement) and NO LAND PRIVILEDGES. That means no Land Multipliers, Improvements, or Shrines, can be purchased. NO KEEPS OR CASTLES WILL BE ALLOWED! Stone: 100 mhl per 2 horses; includes room for feed and tack. Sheds: Above ground with a door to the cellar below. Cellar is same size as the shed. Corrals - out of town. Normal corrals are three feet high, Tall Corrals are 5 feet high. Corrals are NOT solid walls, but simple split rail fencing that has draw bars. More than 10 acres = property is off map. Construction: by anyone other than a highly skilled professional can be dangerous and could lead to a complete collapse. The more extensive the changes wrought in a cavern, the greater the likelihood of collapse. Geomancers: Earth Mages understand the magic used to shape rock, but seldom have construction expertise. They may create cavern rooms that look pretty, but they are still inherently unstable and subject to possible collapse. The more extensive the changes wrought in a cavern, the greater the likelihood of collapse. Cave dwelling: with the exception of dark elves, dwarves, and gnomes, caves are NOT recommended for permanent habitation. Caves in Belariath tend to be very damp. Extended exposure to a cave/cavern interior can cause hypothermia in most surface dwelling creatures unless precautions are taken. The lack of sunlight and green plants can also cause psychological problems for forest loving beings (such as nymphs and sylvan elves). Light: It's always dark in a cave unless artificial light is provided (via a light spell, which must be frequently renewed, using stamina), oil burning lanterns, torches, or candles, all of which become expensive over time. Food storage: creates problems as well due to the dampness. Fresh fruits and vegetables, meats and cheeses and even dry goods (flour, sugar,etc) tend to mold and mildew quickly. Not only becoming inedible, but posing significant health risks if ingested in moldy or mildewed condition. Familiars/Pets: Those not specifically accustomed to underground life will be extremely uneasy in a cave and are not likely to choose such a location willingly. Horses and other stock animals are not "cave friendly" and many will refuse to enter. Cave/cavern floors: are rocky and uneven, making it difficult to walk and almost impossible to build on. Ship Dock - ocean: 300 mhl per ocean-going ship capacity. Requires off-map plot with seaside and beach mod.